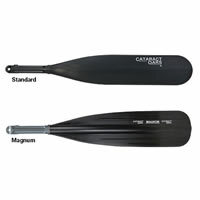 Cataract Magnum II Oar Blades are foam-filled high impact plastic with an aluminum reinforcing shaft. They fit Cataract or Carlisle shafts, using the same push-button system. From Eric Bauman of Eden, Utah on 8/8/2016 .